Carrollwood Day School is proud to present its first Upper School dramatic production. 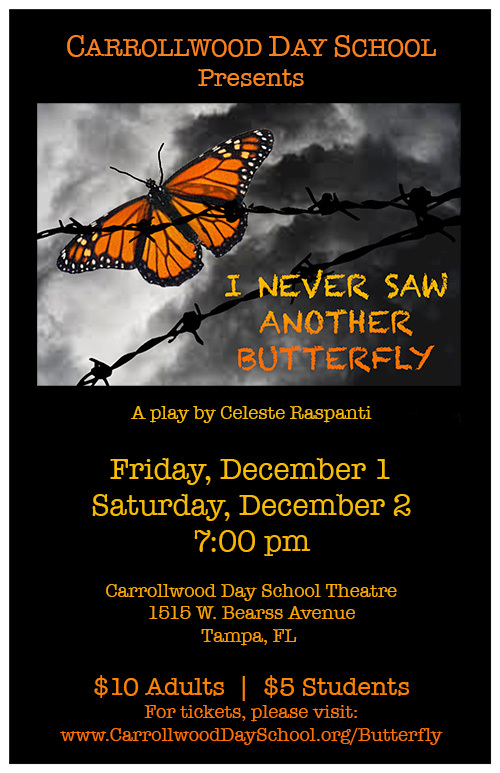 I Never Saw Another Butterfly is a moving one-act play by Celeste Raspanti that details children’s account of life during the Holocaust. The play is based on the poetry created in a concentration camp by the Jewish children of Prague. From 1942 to 1945, during WWII, over 15,000 Jewish children passed through Theresienstadt, a former military garrison set up as a ghetto in Czechoslovakia. It soon became a stopping-off place for hundreds of thousands of Jews on their way to the gas chambers of Auschwitz. When Theresienstadt was liberated in 1945, only a hundred or so children were still alive. I Never Saw Another Butterfly is the story of Raja, a survivor, who tells of the Theresienstadt children and their teacher, Irena Synkova, a woman who gave them hope even when there was none, creating a small pocket of laughter, flowers, and butterflies behind the barbed wire. This play is an imaginative retelling of Raja’s story compiled from documentary materials, including poems, diaries, letters, journals, drawings, and pictures. There were no butterflies at Terezin, but for the children, they became a symbol of defiance on how the human spirit, even in the face of such reckless hate, can always find beauty, hope, and love. Based on a true story, this play shows the best and the worst of which the human heart is capable. ** Please note: I Never Saw Another Butterfly is a heavy emotional piece. The play contains mature content and themes and is not recommended for children younger than 7th grade. The cast for this production is made up of talented students from Carrollwood Day School's upper school division. This production is led Colleen McEvoy, upper school performing arts teacher.